It is recommended that babies spend supervised play time on their tummies to help decrease the risk of plagiocephaly, encourage reaching and increase muscle strengthening in the shoulders and arms. Prone positioning also increase core stability. Try laying in your belly in prone with both arms extended (aka cobra pose). Let me tell you not only will you get an excellent stretch, upper extremity weight bearing and strengthening but you will also be tightening your core muscles to maintain the position. Tummy time isn’t just for babies. 1. Since it easier to prevent problems before they occur, it is very important for babies to spend supervised time on the bellies each day. Get down on the floor and play with baby. Talk, smile and model how to use toys. Hold your baby when ever possible instead if leaving the baby in a container. Have the baby sit on your lap, lay on your chest, or lay on his/her belly over your lap. Try holding your baby in different positions instead of just in a cradle hold such as up on your shoulder or in a football hold. All of these positions and interactions will benefit baby to increase muscle strength, emotional bonds, socialization and overall motor skill development. 2. During the toddler years, encourage the child play simple games on his/her belly or even on all fours. Set up obstacles courses where the child has to crawl from station to station. 3. For preschoolers, introduce some simple yoga poses. The cobra, downward dog, plank, cat/camel and crab pose are a few to start with that will encourage upper extremity and core strengthening. Perhaps the prek teacher can have the children listen to a story laying on their bellies on the floor. 4. For school aged children, try reading in prone on elbows. Watch a television show leaning on your forearms on your belly instead of slumped on the couch. Do wheelbarrow walking over a big ball. 5. Adults need belly time too! Trust me, if you lay on the floor in prone on extended arms you will feel an amazing stretch. Try reading on your belly. Take a break from the phone or tablet in sitting and lay on your belly on the floor to use it. (I am convinced we are going to change the human structure of the spine if we all continue to stay so hunched over our phones or computers – but that is another topic and certainly job security for therapists haha). 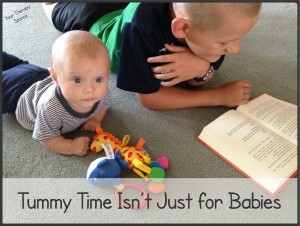 Tummy time isn’t just for babies!